Barack Obama campaigned on the over-broad theme of “hope” and “change,” and one of the changes was to close the terrorist detainee facility at Guantanamo Bay, Cuba, where currently some 240 enemy combatants are housed. Obama had no idea at the time what closing the facility meant, a characteristic common to so many of his campaign ideas. This is a result of his lack of experience in virtually any meaningful endeavor that would prepare someone to serve his country as its president. Fortunately for Mr. Obama, and unfortunately for the nation, far too many people don’t seem to notice his failings, or don’t care about them. He is learning, ever so slowly, ever so painfully, that being president is a vastly more complex and daunting job than running for the office, and he is discovering that his predecessor knew not only a lot more about what he was doing than Mr. Obama imagined, but a lot more than Mr. Obama himself actually knows. Columnist Deroy Murdock has written a column appearing in Saturday’s local paper about this dilemma, suggesting what many of us knew and said before the election: It makes no sense to close Gitmo. Mr. Murdock correctly points out that Gitmo is anything but the hell-hole it has been made out to be by those whose understanding of war and the necessary handling of enemy combatants can fit on the head of a pin, and shows us that it is a far more desirable place than an actual American prison, were we to consider that option for these scum. 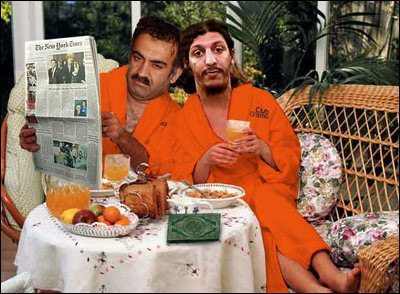 At Gitmo the terrorists are treated to such horrors as satellite TV complete with an Al Jazeera channel, Sudoku puzzles, soccer, basketball, English classes, Arabic newspapers, Islamically correct meals and Muslim prayer periods five times daily. Americans overwhelmingly do not want these terrorists housed in prisons in the U.S., or brought into the U.S. justice system, and most countries are reluctant to accept even one of them. Other countries are not asked to take the terrorists, because they would likely torture and/or kill them, and heaven knows we can’t allow that to happen. Besides, a significant number of the terrorist combatants who have been released, 14 percent, have gone back to their terrorist ways, killing innocent people in cafes or schools, or training new recruits how to do it. So what can the president do? He may have no other choice than to leave them at Gitmo, now that he understands why George Bush created the facility and understands how sensible it was for him to have done so. So, if it’s “change” you want, Mr. Obama, why not change the way things are done at Gitmo. Do away with the pampering and the pandering, and treat these animals the way they deserve to be treated.